So I have mentioned a time or two that we have been on a healthy lifestyle since the new year and I have also been cooking at home more. Both were my new year resolutions, but since I have been cooking at home more we have been eating healthier anyways, but I digress. I have been looking for healthy snacks and did you know you can have TWO tablespoons of peanut butter as a protein packed, low carb snack? 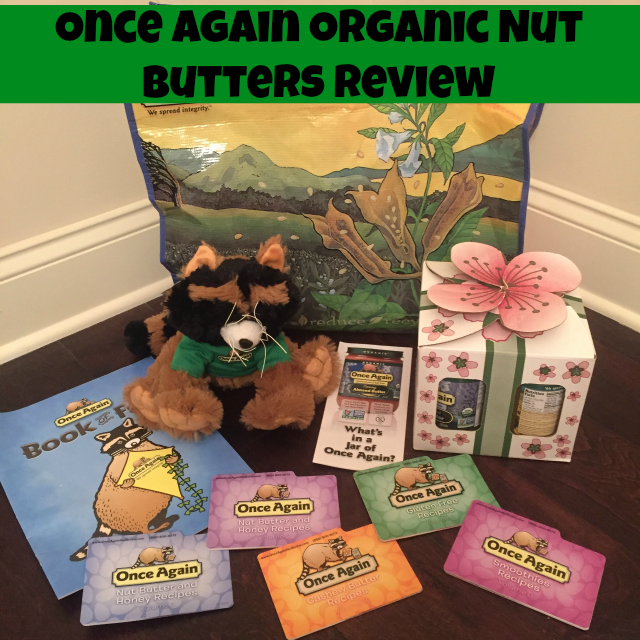 I was recently sent this amazing review package from Once Again Nut Butter. They are an employee-owned business, located in upstate New York, that has been manufacturing nut butters, seed butters, and honeys since 1976. Their nut and seed butters are all gluten free certified, non GMO verified, certified organic, vegan, and kosher. Once Again Nut Butter follows Fair Trade and Sustainability standards for their farm partners, suppliers, and prices. - Once Again Sunflower Seed Butter is made by roasting organically grown sunflower seeds. The seeds are milled smooth with sugar and salt added to create a delicious sunflower seed butter. - Once Again Peanut Butter uses organic peanuts that are dry roasted and milled. Oil separation occurs naturally. To prevent, stir and refrigerate or freeze. Very yummy straight from a spoon! - Once Again Almond Butter uses only the finest organic almonds available. They are dry roasted and milled with nothing else added to produce delicious organic almond butter. I had never had almond butter before I tried just a spoonful and I didn't care of it as is, but it tasted in the smoothie recipe found below. - Once Again Cashew Butter uses only the finest organically grown cashews to create a super creamy organic cashew butter. 5%-8% expeller-pressed organic sunflower oil is added to enhance the spreadability of this butter. In my kit were a bunch of different recipe cards. 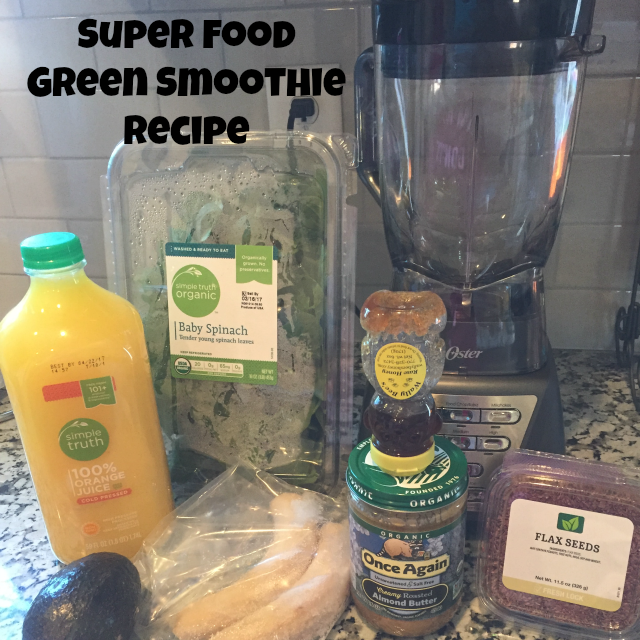 For some reason, I had my eye on trying the Superfood Green Smoothie Recipe. This was my first green smoothie I have ever made or tried in my entire life. I was so nervous about it. I even gritted my teeth as I was about to try it, but it was so yummy. It tasted like the orange juice to be honest and I might consider about switching to a different juice next time, but if that's your thing then you will LOVE this recipe. I loved it and don't even care for orange juice normally! Places kale and orange juice in a blender and puree for 2 minutes. Note: It is best to use baby kale in smoothies. Standard blenders have a tough time breaking down kale completely. Baby spinach can be substituted. I chose this recipe because I had everything already, but I am very excited to try more recipes with these nut butters. Keep in touch with Once Again on Facebook, Twitter, Pinterest , and Instagram to see their latest products and special offers! Do you like Nut Butters? What do you think about Once Again Organic Nut Butters? Have you ever had a green smoothie before? I haven't tried any besides peanut butter and we of course adore that!! 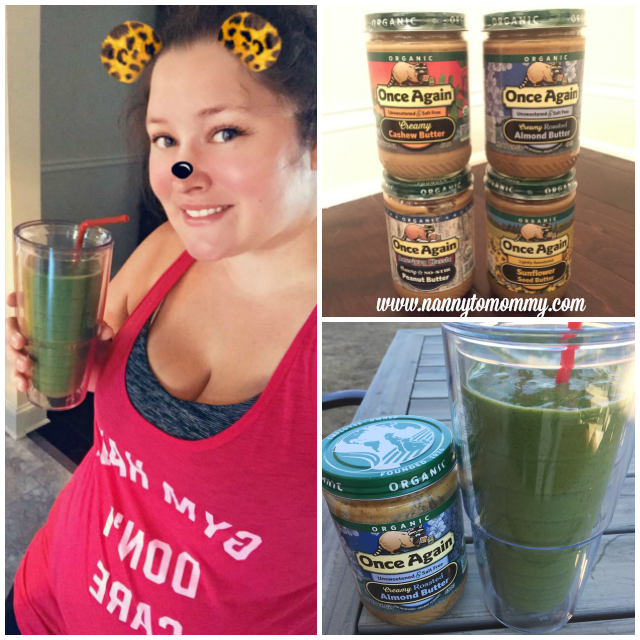 I love green smoothies though and will be on the lookout for these once again nut butters!! Once Again Nut Butter seems wonderful to try. My family loves different nut butters and I have not heard of this one. It seems healthy and tasty and I would enjoy the smoothie also! This smoothie looks awesome! We love nut butters, but I've never heard of Once Again. I'll be on the lookout for them! I make a similar smoothie for my grandson but we have not tried the Once Again Peanut Butter I would love to try it . I never tried a green smoothie before but I am going to try one now. I love the idea of using nut butters with kale, etc in smoothies. They should be very good for me. I love the smoothie idea! Yummy! Nut butters are great for low carb baking options. I have tied their nut butters and really like them. They taste really good and they are really enjoyable. I was surprised they tasted so good and try and keep a jar or two on hand. I've never tried avocado in smoothies before but it seems it would make it very creamy. Will be trying this smoothies once my avocados are ready! Cool packaging designs on this one! I love Once Again Nut Butters, and love to use them in smoothies.